Last weekend after coming home from spending the day at the play centre for Elliw's birthday, I found myself sitting at my laptop looking at old photos. Thinking about old times. Old times at school and old times such as my childhood, my family and friends. It got me thinking how many things have changed in such little time. How short life really is. It's soon to be 4 years since my Great Nain passed away. She never had the chance to meet Elliw. I had planned to take her on Mothers Day back in 2012, to meet her for the first time, but she couldn't wait that long. She had a stroke and sadly passed away. It has left a huge hole in our family but it has brought us much closer too. Once upon a time my Dad used to take me and my brother to see my Great Nain (pictured above) most weekends. We sometimes went with my Taid too. There is a big mountain behind her house and we always used to have some walks up there and end up playing the park afterwards. She loved playing with her wedding rings and she always had her coal fire on. The kitchen, dinning and living room was in one big-ish room. Not that big though, but it had everything there. Looking back it was a really old fashioned but cosy little room. She had an old fashioned squared television on a moving tray with legs and pretty uncomfortable sofas. 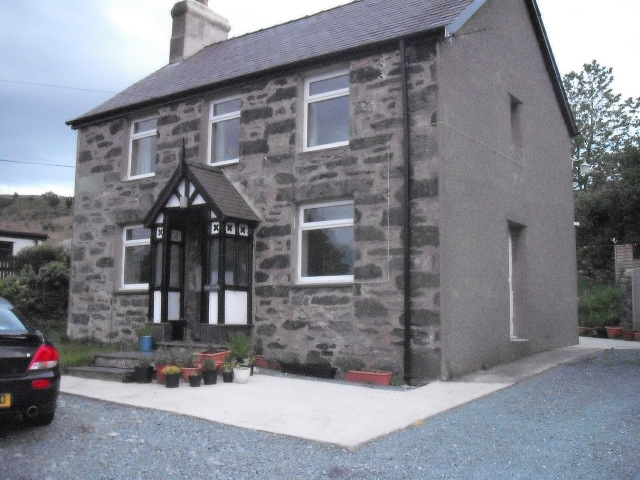 But everything in that house was my Great Nain. The kitchen was old fashioned. How I would love to see that room how it was again, just one last time. She always gave me and my brother a bowl of sugar cubes and we loved it! Not a clue why, but we did. I never really liked having to go to the bathroom/toilet whilst we visited because I always thought the front room, full of glass cabinets with old family photos, was cold and pretty spooky. Going up the steep narrow stairs to go to toilet, I would never look back and always rush back down stairs because I always felt like someone else was there. It was creepy at the time and I was sometimes petrified but looking back I just wish I could do it again. Have that feeling that someone else, a family member was there. The house was built by my family. My family bought land of Lord Penrhyn and they built the house by scratch. Such an old but beautiful house. Every time we went home, we would drive out of the long drive and would see my Great Nain picking up the netting on the window and wave to us, without fail. I always try and remember when the last time was she did that but I honestly can't. Writing this now I am in tears because all I see is her beautiful face smiling. That part always gets to me. The day of her funeral, the funeral car started from that house and all I had to do was look at the window and my heart broke. It just didn't seem right, it didn't seem real that she was in the funeral car, lying there peacefully whilst the window was empty. What I would do to see her in that window one last time. All I have is the memory and image in my head. 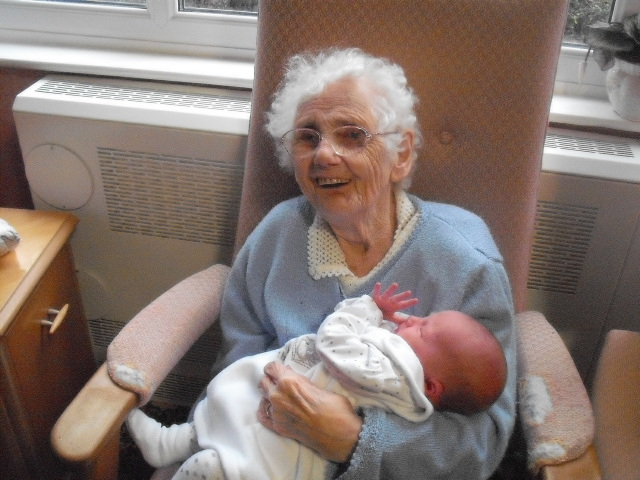 When Mia arrived, my Great Nain was in a care home. 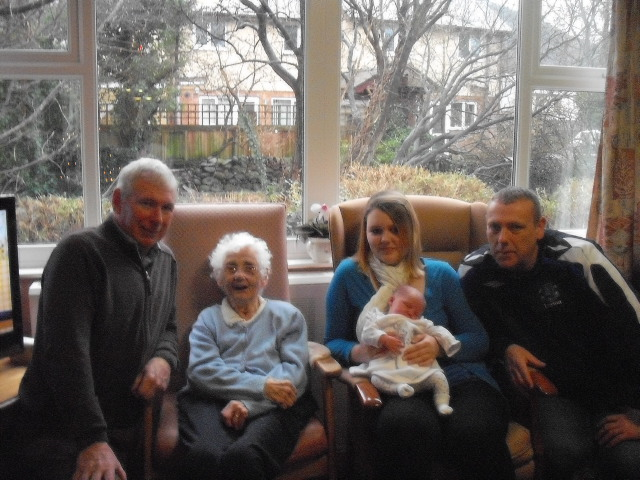 So Mia never had the chance too meet my Great Nain at her own home but she always loved seeing her in the care home. My Great Nain was over the moon with her. She lost a bit of memory sometimes and had to remind her who we were most of the time. The smile she gave Mia the first she saw her is something I will always remember and never forget. I even managed to capture it. That is why I think photos are so important. Unfortuently, Elliw never got the chance to meet her. Elliw was born on 5th of March and we had planned to visit my Great Nain on Mother's Day on the 18th March (2012). She couldn't wait that long. On the 14th of March 2012, I had a phone call off my Dad. He told me my Great Nain wasn't well and she had a stroke. It didn't look good he said. At this point, I was in the car with Elliw, Mia and my partner. After the phone call I had tears streaming down my face. I didn't know how to tell my partner because I had never ever been in that position before. My partner was really caring. We cancelled the day out and went to the care home. When we arrived we decided to keep the girls in the car and my partner stayed with them. I went in, I was so nervous. I didn't know what to think or what to expect when I arrived at the room. The carer took me to the room and I saw my Nain, then I saw my Taid sitting by the bed where my Great Nain was lying. I just cried. My Taid got up and gave me a hug and so did my Nain. I was not expecting to see my Nain how she was. She didn't look herself. She wasn't herself. 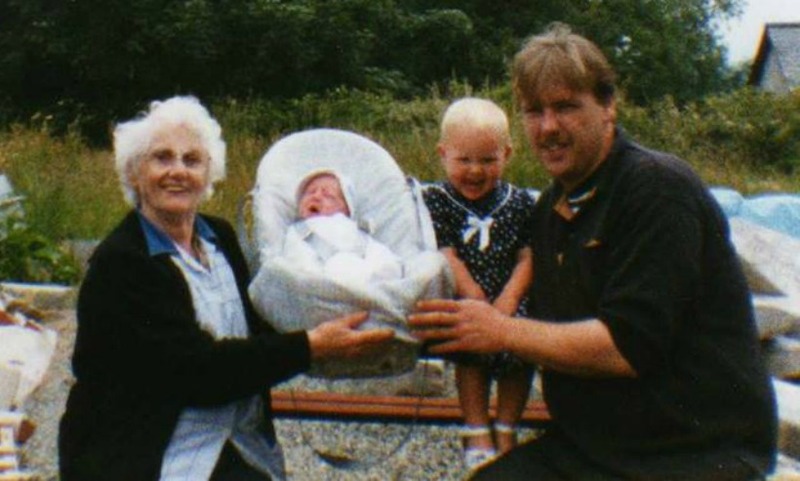 Seeing my Nain and Taid in tears and upset hurt me as well. I couldn't stay long as the girls were in the car but I was so glad I had seen my Nain before she passed. A few other family members managed to see her too. Then there was the phone call, she passed away. My lovely Great Nain had died. She was gone. A part of me feels so guilty that I hadn't taken Elliw there sooner. Although I had no idea she was going to pass away, it just proved to me that life really is way too short to 'wait' for things. I look back and I wish I went to see my Great Nain a lot more than I did. I wish I had taken Elliw before she had passed. But I feel that my relationship with grandparents right now is so strong. They mean the absolute world to me. If you know that you don't see a family member often or not as often as you should, please go and see them. Make some memories with them. Don't wait for them. Because one day they will be gone. You will never see their face again or hear their voice again. Please go and visit them. This is such a beautiful post. I'm incredibly close to my nan and we have so many fond memories to recount like you. What beautiful memories, it is so hard not to feel guilty with things when things like this happened but just keep holding on to these beautiful memories of her. This made me a little sad. My granny and grandad died a few years ago and my mum died 2 years ago which leaves me with no family. I often lie in bed thinking about the good times and how great my childhood was.